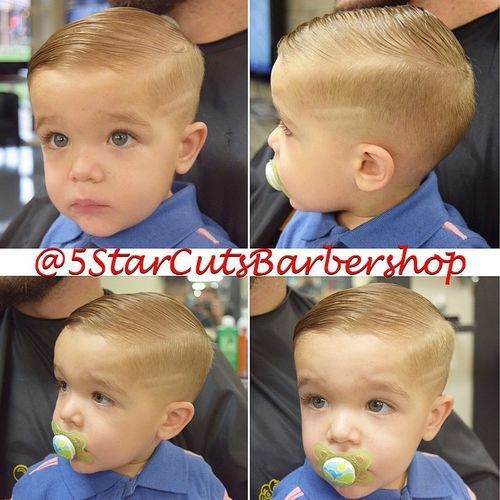 Like all male hairstyles, current haircuts for baby boys are an exciting mix of classic looks and trendy new ideas! There are plenty of fusion haircuts that include a blend of popular looks from the past, with a snappy, contemporary twist! And looking at these gorgeous baby boys and under-10’s – just after they’ve got a new hairstyle all ready for their ‘close-up’ – is really enjoyable! Here’s a happy chappy pleased with the attention he’s getting for his new haircut! The short-back-and-sides has a longer top in this hairstyle with a deep side parting and naturally wavy hair styled to one side. 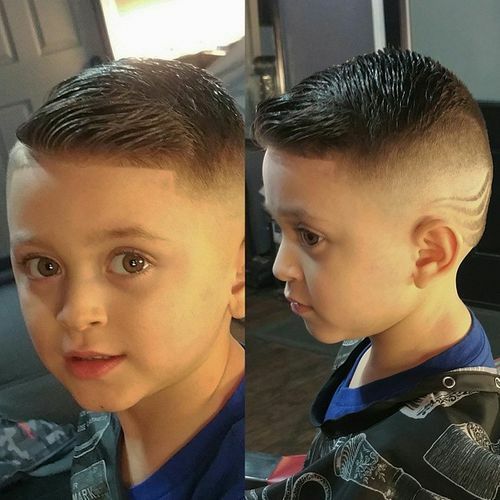 The longer length with rippled texture is the perfect casual look for a future athlete! This beautiful boy seems a bit uncertain about spending time in the hair salon, but the cut is extremely flattering to his sweet, little face. 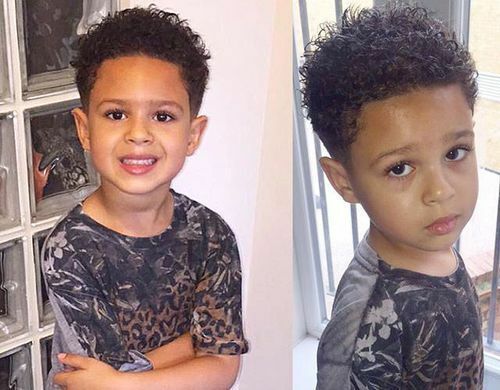 His fashionable short back and sides cut has a soft halo of perfect curls adding height and a rounded outline that’s adorable! All spruced up for a special occasion, this white-shirt and blue bow-tie call for something extra-special in the hairstyle department! The popular Mohawk shape has, in this case, actually been styled up into a short Mohawk kept in place with just a touch of product. No wonder this baby looks confused, he thought he was going for a drive in a shiny red car and then a lady attacks him with a buzzy machine! His short-back-and-sides has a side parting and a longer top, combed back in a flat wave softening the hairline. 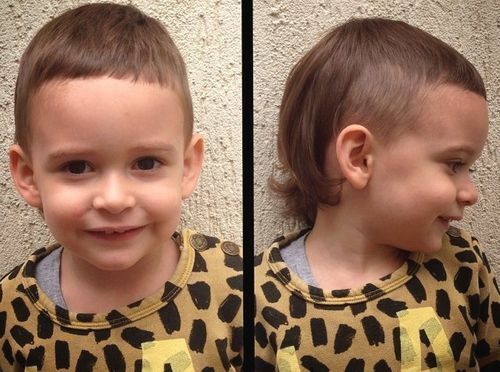 With trendy ‘go-faster’ stripes in the sides and back, this young man’s already a fashionable boy-about-town! No need for that apprehensive glance up at the barber, your blonde locks look perfectly groomed in this side-swept style. The top has a little natural wave creating extra texture and two short parallel lines shaved into the side add an extra touch of contemporary style! 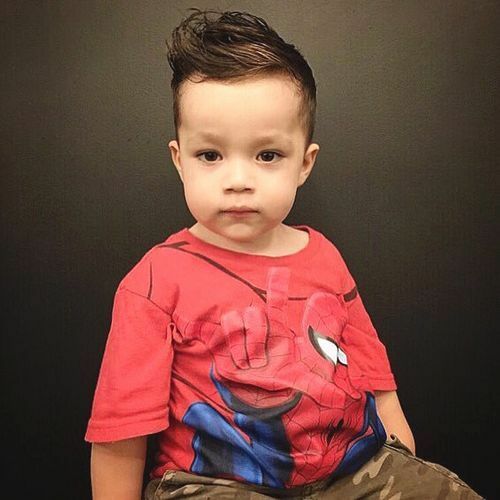 This baby spider-man fan needs a special super-hero cut to highlight his strong, silent look. This cut has the longer top length required to create a trendy tousled quiff with a modern asymmetric vibe. 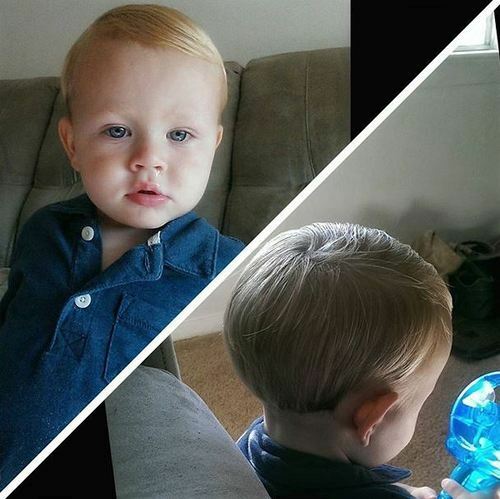 Extra height on top suits healthy, chubby-cheeked baby boys perfectly! 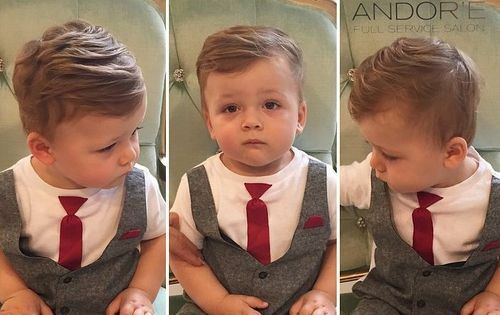 Looking smart in a striped suit, this little cutie is wearing a classic male hairstyle suited for daily wear and perfect for a special occasion. The cut is a trendy short-back-and-sides with short side-swept bangs softening the forehead line! Here’s a totally up-to-date haircut for straight black hair with a clipped back and sides. The top hair is left longer in a Mohawk cut that’s combed forward and then flipped back into a playful quiff above the forehead. 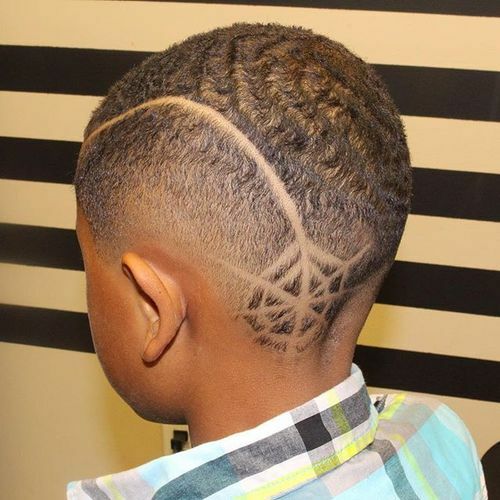 To finish off this dashing look, just add a hip-hop zig-zag etched into the side! Fresh from a quick tidy up with the baby brush, this little boy would look perfectly groomed if only he’d let dad clean up his runny-nose! Well, we’ve all been there before we learned how to use Kleenex – LOL! The classic side parting and carefully layered back are perfect for fine hair. 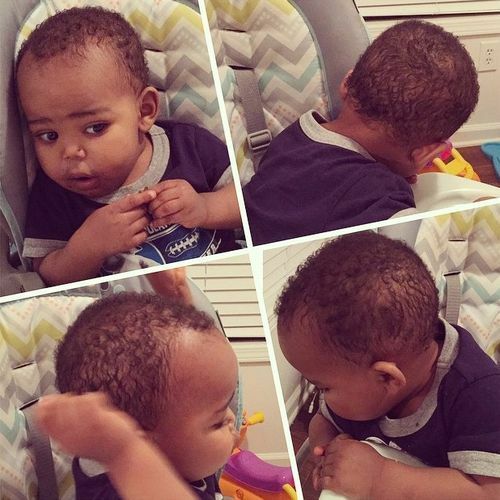 This cute little boy is obviously curious about what’s going on around him as he spends time playing in his car-seat! And to suit the relaxed atmosphere his casual, natural hairstyle shows how well short, graduated layers display natural curls in an adorable wavy texture. 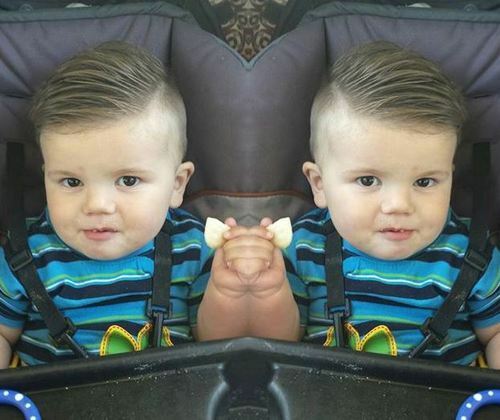 This image underlines the importance of choosing a baby’s haircut in line with their head-shape. 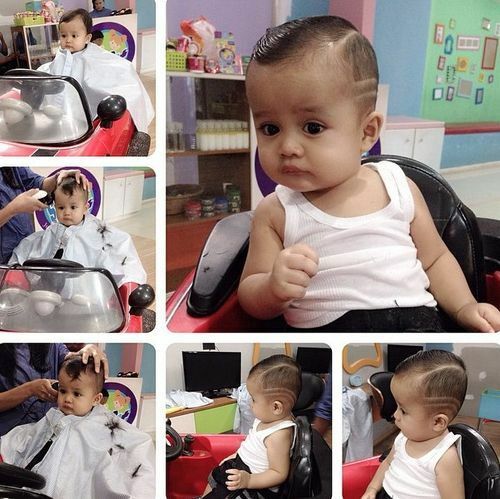 This baby-girl’s head shape, looks deep and ‘sharp’ with shaved sides and an edgy, angled haircut. However, with longer sides and the back in graduated layers, her head would appear rounder! 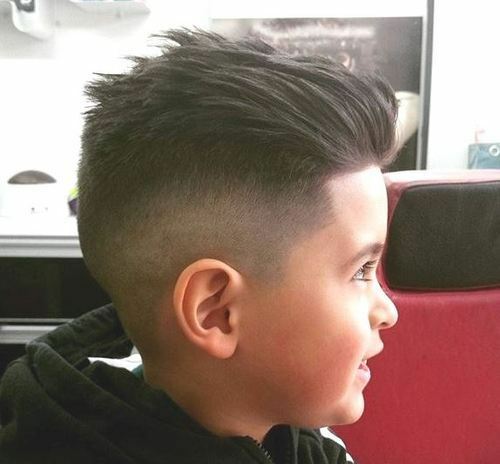 Older boys with thick hair look great with this short-back-and-sides Mohawk cut, with the top section cut in special sliced layers. Sliced layers remove all the bulk from the ends of thick hair and have sharply pointed tips, for easy management. 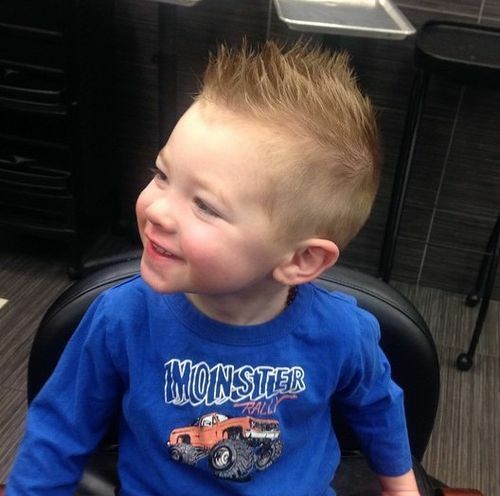 Boys love this tough and boyish porcupine style! Most people’s hair has at least a little natural wave or movement and a good stylist should always cut to enhance the natural direction. 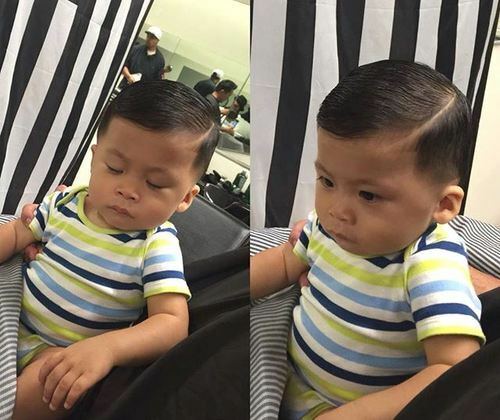 This cutie has fine, thick hair cut in a deep side-parting to suit a round face. The slight natural wave is styled to create attractive texture in his lovely thick hair swept across the top! 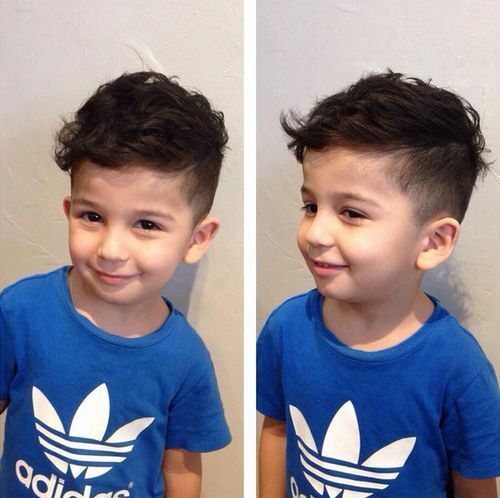 Modern haircuts with newer ways of styling boy’s hair can look so adorable above a cheeky little face. 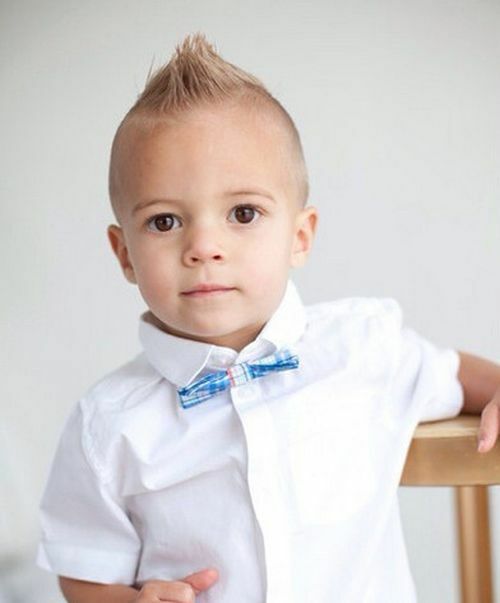 This confident and smiley boy is already a miniature version of a trendy young man with his spiky tipped Mohawk! To style, comb forwards from the crown and into a quiff! This unique haircut is a creative fusion of various vintage hairstyle ideas. The main difference from mainstream haircuts is the length at the back, which is layered near the wavy tips. The shorter top is graduated and brushed forwards into short bangs and the sides are clipped short to resemble the edgy look of shaved sides! 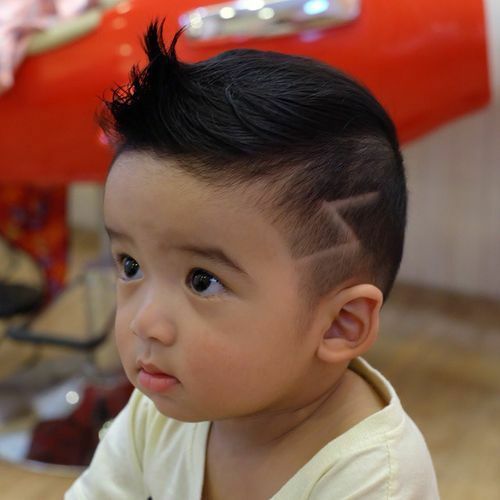 Here’s a trendy but tasteful high-fashion look that’s very popular with rapidly-growing ‘baby boys’! 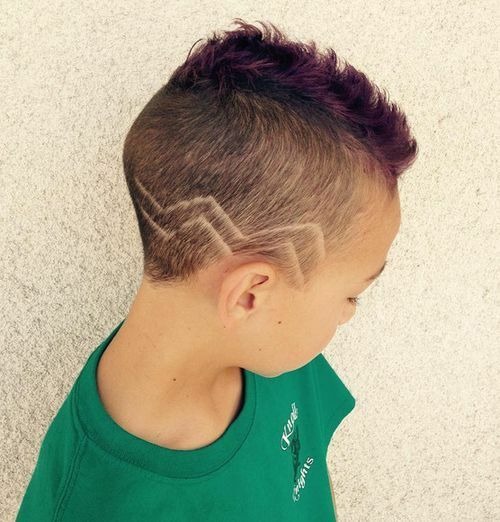 The short Mohawk has been tinted a subtle, but fashionable shade of deep violet to complement the model’s skin-tone. And shaved lines continuing around the back of the head add another smart new twist! 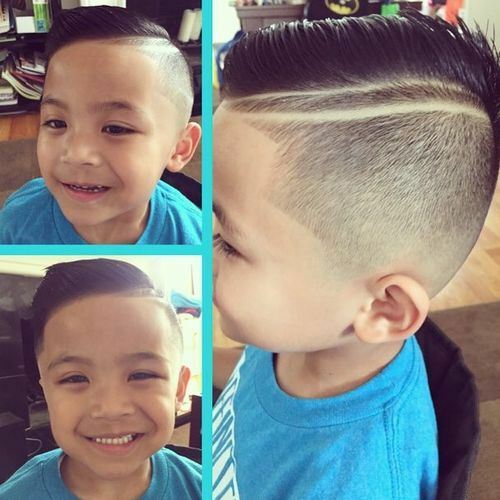 Here’s another contemporary look that looks super-cute on this ‘little man’! The side-parting is echoed by a parallel shaved line above a short-clipped side. The swept-across longer layers on top add flattering height for a round face, and with that happy smile he looks like a million dollars! Full marks must go to the stylist who created fantastic, ‘raised’, curvy lines on a short-back-and-sides haircut! This look is an alternative to shaved lines and can be used to create a new and attractive look. Long layers on top are styled forward from the crown and back from the forehead to create even more attractive texture! 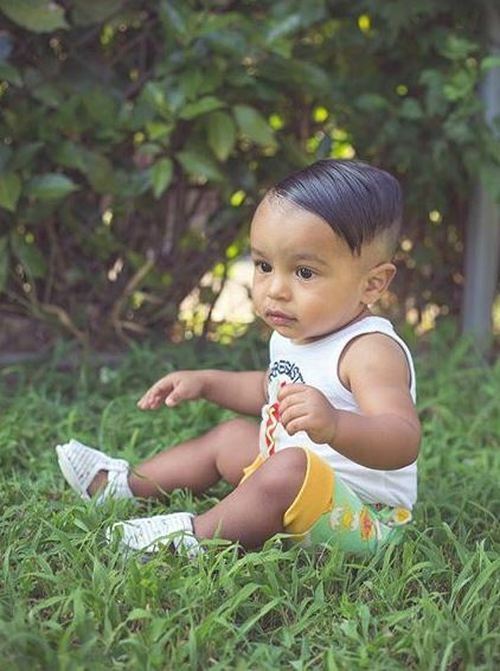 Here’s a modern comb-over style for baby boys with plenty of thick, fine hair – as opposed to the ‘bald-man comb-over’ worn by celebs like Donald Trump! It’s a slick, elegant and modern style that just needs a touch of styling product to stay looking good for hours! At this age, you don’t need to worry about choosing the best styles for different face shapes. Most babies have naturally chubby cheeks, so side partings with a little extra height on top are a face-flattering choice!